Sandra Oh’s Golden Globe-winning show is coming back! Eve and Villanelle will make their returns on BBC Sunday, April 7. Starring Haley Lu Richardson, The Chaperone follows a teen girl with big dreams of dancing in the 1920s. Out April 5. The second official installment of Sabrina, following Kiernan Shipka as a teen witch torn between high school and her future as a young witch is streaming on Netflix. Released Friday, April 5. Weyes Blood’s magical latest album questions everything from modern dating to the psychological side effects of movies, writes our reviewer. Out April 5, and stay tuned for our full review on BUST.com. Brooklyn-based musician Lady Lamb’s third studio album is “about facing who you are and fighting your way toward self-acceptance,” the singer-songwriter writes in a press release. Out April 5 through Ba Da Bing Records. Both Rosalía and Blake rarely disappoint, and this song (and video!) is another gem. Released April 4. This essay collection from the bestselling author of American Housewife is about everything from thank-you notes to gynecology. 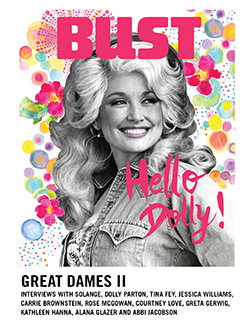 Out April 6, and be sure to check out our forthcoming review in BUST’s May/June print edition. This story of a boy’s coming of age in Thailand made a name for Parwana in 2003, and the novel is finally translated into English. Snag a copy April 9.